Home Home Improvements Homeowners Insurance Nightmare… the FAIR Plan. Homeowners Insurance Nightmare… the FAIR Plan. As mentioned earlier in the year, I found out the hard way that insuring a newly purchased older home is near impossible. Now that we’re in the final stretch for the exterior renovations, it’s time to start thinking about acquiring some conventional homeowners insurance. Currently, my carrier is a state run plan, called a FAIR plan. Most states have them, and I’ll be the first to tell you, they’re anything but FAIR. The premium is generally double what you’d pay to an insurance company you’ve heard of, and you coverage is half what a real insurance company would carry. The FAIR (Fair Access to Insurance Requirements) Plan Association offers property insurance to qualified applicants who are unable to buy insurance through the standard insurance market for reasons beyond their control. The FAIR Plan may be an answer for responsible property owners or homeowners who are having a problem obtaining property insurance in the standard market. Many insureds use the FAIR Plan as a temporary market for a year or two until they qualify for coverage in the standard market. It’s been nearly 5 years since Allstate cancelled my policy. Surfing the web, I’ve yet to find a “successful” journey from the depths of the FAIR plan. Seems once you’re categorized as high-risk, it’s damn near impossible to get normal coverage. I’m hoping I can blaze a new trail. One thing I have read is that when an insurer cancels your policy, they must send you a letter explaining why they’ve cancelled you. Over the weekend, I peeked into the old filing cabinet in search of the old Allstate folder. I was skeptical that I’d still have the letter. At the time, it was like a punch in the stomach. I’d just paid my first ever mortgage bill, I had no money left to my name, and now suddenly, I was about to let my insurance lapse before the second mortgage payment. I thought I’d likely thrown it out in anger. To my surprise, there it was…an interesting read. It almost made me more angry seeing how trivial all of the ‘problems’ were. I kept thinking that they were nailing me on the electrical system, but in fact, there is no mention of that. The detached structure has dry rot, glass broken, trees overhanging and needs paint. One or more of the trees on your property poses a risk to your property because it is overhanging. According to much of what I’ve read, technically, if I correct Allstate’s laundry list of problems above, they should take me back. That said, since they burned me so bad back then in 2002, they’re not exactly my first choice. Oh, and Allstate is no longer issuing homeowners policies in my state because we’re apparently in a hot hurricane zone. A little back story first… when Allstate sent out their inspector, I was having a cable line added to the second floor of the house so I could have cable internet in my home office. Being broke at the time, the cheapest route, rather than snaking it through the walls, was to have the electrician run the line in one of those PVC tubes up the side of the house. Apparently, while the electrician, a fellow in his 70’s, was working on the side of the house, the Allstate inspector stopped by and asked to go inside the house. The electrician said, “No.” When I arrived home that evening, the electrician explained to me that he’d had a “run-in” with an aggressive insurance inspector trying to enter my home. I thanked him for not letting the inspector in my home. I was never made aware that an inspector was coming by, and thinking about it, I never recall having an insurance inspector ever enter our home when I was living with my parents. I was thankful that the electrician hadn’t let some stranger in my home without me there. Then the cancellation letter came and it all became clear. I’d guess that the insurance inspector thought the electrician was the homeowner and refused to allow him entry. Ticked off, he essentially checked off every box on his standard form, in an immature “I’ll show you!” act of rage. Windows need paint? Um… they’re vinyl windows. At that time, they were only 2 years old. That aside, you don’t paint vinyl windows. Renovations incomplete? Um, okay, the contractor was there working on them at the time you stopped by without notice. Trees overhanging the home? This is New England. I challenge you to find a residential home within a 100 mile radius of my home that doesn’t have a tree limb near the structure. Those boxes were checked out of spite. Pure spite. The rest of them… I could call legitimate… at the time. Which is why I didn’t dispute the letter. The roof was old. The roof was ugly. But you know what? It didn’t leak. But I still spent $14k replacing a roof that didn’t leak. The chimney was crumbling…we had it removed entirely. The foundation was crumbling…we had it repaired. All of this business about needing paint and peeling paint — well, vinyl siding is taking care of that. All of that aside though, it is a little troubling that your insurance company can essentially cancel your coverage because your house could use a new coat of paint. I can understand the “crumbling” brick work being a bit of an insurance problem, and realistically, that is where their list should have begun and ended. And I would have taken care of that immediately, but to pile on all of the additional cosmetic issues seemed a little unjust. 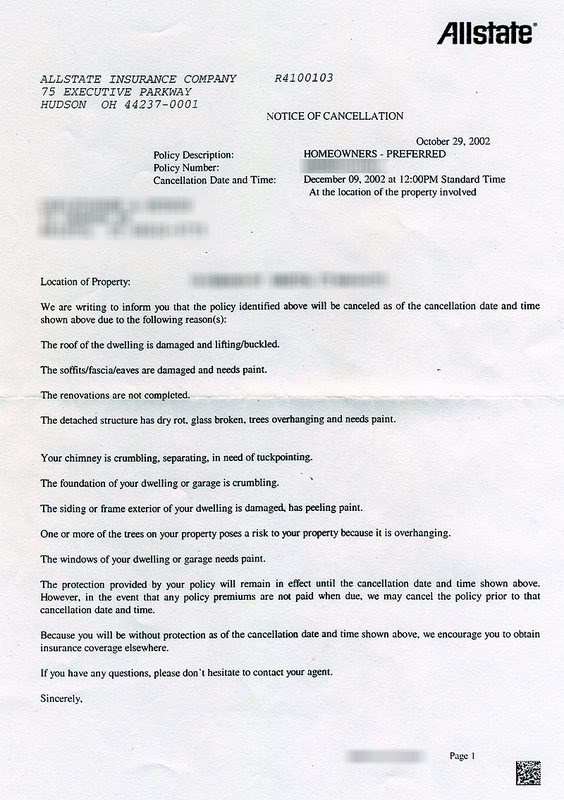 Especially when they agreed to insure the home for the closing, and then cancelled the policy less than 30 days later.